Check out today's pricing and retail availability for Pellegrini Vineyards Encore . 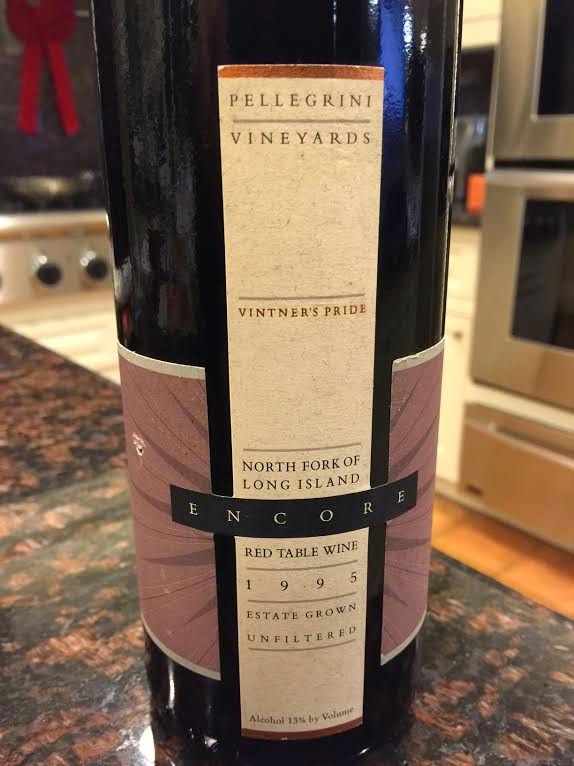 Original tasting and review : This is Pellegrini Vineyards Vintner's Pride Encore Red Table Wine, North Fork, Long Island, New York, 1995, finished at a mere 13% alcohol and first sampled a whopping 19 years from vintage date, in December, 2014. In the glass: Deep brick, opaque from three quarters of an inch from the edge of the glass. On the nose: Poured at cool room temperature and swirled vigorously, shows soft, aged red berries. From the aroma, seems like this will be tired after almost two decades in the bottle. On the palate: The primary elements on the palate are in fact full, bright, with more verve than anticipated from the aroma. Shows some age, but actually presents a strong palate of blackberry brightness attached to bold acids and cleansing tannins. Carries a lot more punch than the 13% alcohol would suggest after this much time, partly because the bold acids carry the supporting framework. In summary: Overall, rates a solid three stars on the five-star Spirit of Wine scale after two decades. Not a bad showing at all!